At the NHL Draft in Pittsburgh, I had the privilege of meeting some of the folks at the Hockey Hall-of-Fame and they treated the Upper Deck staff to a great experience. Since then I have kept in touch with them working together on projects with Upper Deck and the Hockey Hall-of-Fame. I was invited for a tour of the Hockey Hall-of-Fame (HHOF) and Archives building if I was ever in Toronto. The Sports Card & Collectibles Expo in Toronto was looming and I jumped on the opportunity to work this show in order to cash in on this cool experience. Since the show was happening right around the annual Hall-of-Fame induction ceremony, I decided to take some vacation time after the show to stay for that event and to really enjoy Toronto. After three busy days at the Expo, I was excited to check out all the hockey history in the Ontario area. Working at the show kept me so busy I felt like I needed the vacation as the Upper Deck booth was very busy throughout the weekend. It is easy to understand why as we had great deals on Upper Deck Authenticated memorabilia items, a variety of raffles, case break promotions and the always popular Priority Signings wrapper redemption promotion. I finished up on Sunday and then it was off to the Legends Classic Hockey Game. I brought a customer and we had great seats right by the glass. There was a pre-game ceremony in which the Class of 2012 HHOF Inductees each received their HHOF blazers and watches on the ice. Next, the star-studded game commenced. This game was very different in that it was just for the fun with many of the players not even wearing helmets. Having never seen players like Darryl Sittler, Lanny McDonald, Steve Shutt and Bryan Trottier skate before, it was awesome to just get a feel for their styles as they hit the ice. Seeing the greats skate again was truly an awesome experience. I was in complete awe seeing names like Pavel Bure, Dino Ciccarelli, Paul Coffey, Dale Hawerchuk, Joe Sakic, Doug Gilmour, Joe Niewendyk and Mats Sundin playing on the ice at one time, and I realized this was better than any playoff game I have ever seen. At one point during the game, Bryan Trottier came out on the ice with a guitar and sang a Johnny Cash song with Ron Duguay singing backup. After the game we got to meet some of these legendary players like Lanny McDonald and he seemed genuinely excited to hear about some of the new cards we were coming out with for him. 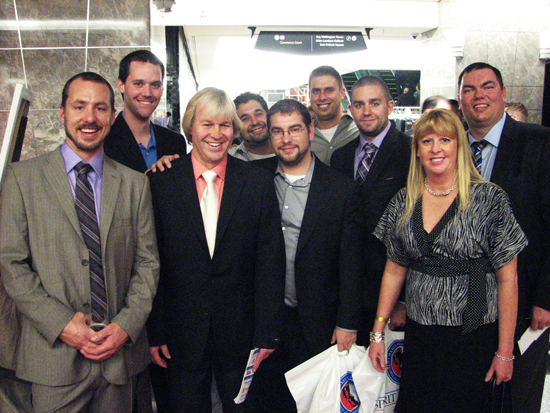 We had a great crew to take in the Hockey Hall-of-Fame Induction Ceremony including Phil Pritchard; the Keeper of The Cup himself! On Monday for Induction night I attended with a variety of customers who were happy to meet my friends who are the keepers of The Cup: Craig Campbell, Howie Borrow, and of course Phil Pritchard, HHOF V.P., Curator and main “Keeper of The Cup.” The place was brimming with old-time players and I was over the moon meeting Johnny Bower and Ted Lindsay, among others. The ceremony was held upstairs in the main corridor, with only family allowed up there, and everyone else being downstairs, watching on live-feed. What an iconic group of legends! After the ceremony, the inductees all filed downstairs, led by a bagpiper and Canadian Mounties. They proceeded through the HHOF to another ceremony deep into the Hall where all the inductees then signed the registrar book. After a lot of great food, drinks, silent auctions, and mingling, the party was over and the after-party next door began. It was a blast! Having lived in California for so long, it took me a little bit to get my skating legs back. Tuesday evening would bring a dinner for some of my friends at the Hockey Hall-of-Fame at a friend’s restaurant and we decided we would have a skate the next morning at the Doc Seaman Hockey Resource Center & Archives. 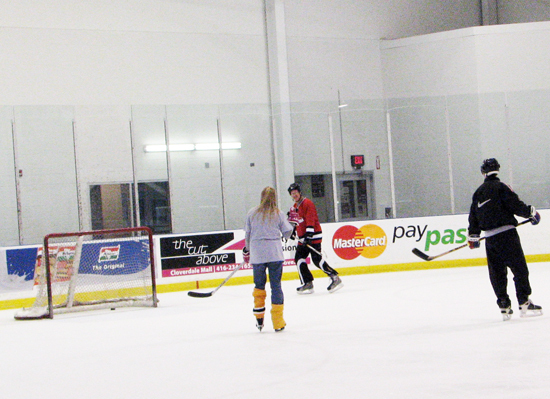 I was loaned some hockey gear and had a blast. As people found out I worked for Upper Deck, one of the popular jokes that morning was that I am the one who puts the bubble gum in the packs of cards. I didn’t have the heart to tell them bubble gum does not come in card packs anymore and you wouldn’t want to try the ones that it did come in decades ago. 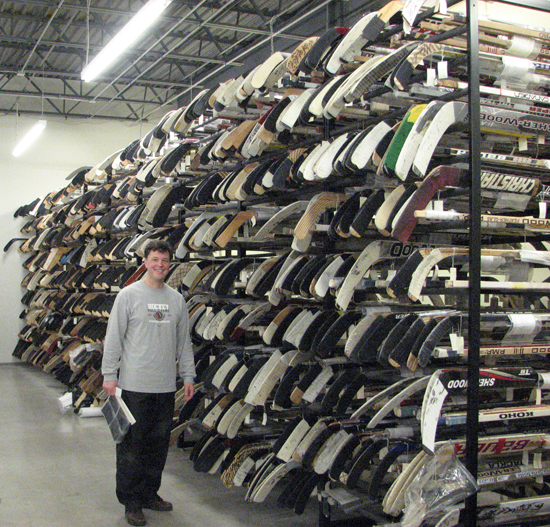 The hockey sticks housed in the Hockey Hall-of-Fame Resource Center and Archives is truly mind blowing, especially considering each one came from a major milestone or monumental moment. After our skate, I got the royal tour through the archives. This building is amazing. The floor has been reinforced to hold all the weight of all the classic artifacts they house. They have a great process for scanning and cataloging everything that comes through the door. They are a non-profit organization, and receive all their items as donations. Most everything they receive is accepted in, and they welcome classic donations of everything hockey-related. They have a huge racking of sticks – all tagged with what they were used for. They all have a story tied to a great goal or game they were utilized in. They have shelves and shelves of jerseys, pucks, trophies, pictures, film, programs, and much more. 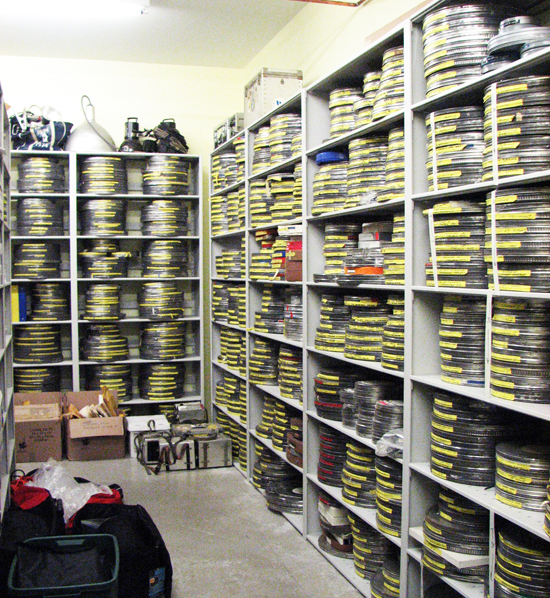 The amount of meaningful film they have at the Hockey Hall-of-Fame Resource Center and Archives is just dazzling. It would take someone years to ever try to watch it all. A favorite stop was in the room where they receive in product that has natural fibers. They have a process where they freeze the item, thaw it, then re-freeze again to make sure there are no critters living in the fibers. 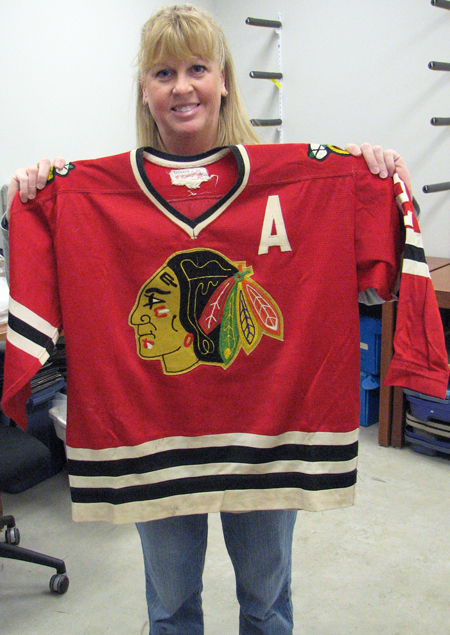 In this room, they had my favorite item on the tour – a Stan Mikita jersey from the ‘60’s which I was able to check out. Being from Chicago originally, I am a huge Blackhawks fan. It is always so exciting being close to artifacts from your favorite team or players. This Stan Mikita jersey was a personal favorite. 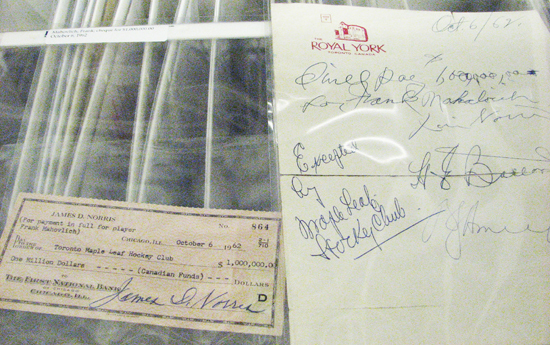 Another highlight was the roughly drawn 1962 contract on hotel stationary and check that Chicago Blackhawks’ owner James D. Norris offered $1 million for Frank “The Big M” Mahovlich. This deal never happened as the Leafs’ co-owner Harold Ballard matched Mahovlich’s salary demand the next day and the story goes that The Leafs were then accused of reneging on the deal, although they claim there was a misunderstanding in the contract. It was awesome to get such a cool tour of hockey history. What would the Blackhawks have been like if they had Frank Mahovlich on the squad? It almost happened! On Thursday I took a little more time to tour the Hockey Hall-of-Fame because only certain areas were open on the night of the Induction. It really is a place where you could spend the whole day if you are a hockey fan and that is just what I did soaking up all the history there. 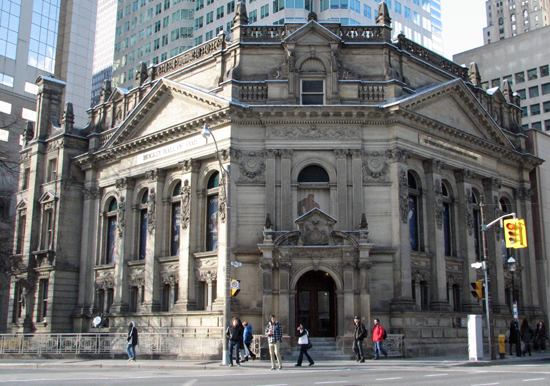 If you are a real hockey fan, you could easily spend all day at the Hockey Hall-of-Fame. I should know, I did. The next day I took a couple members of the Hockey Hall-of-Fame out to Kitchener where we visited a local hobby shop called Clouts ‘N Chara. We had some great fun in the store getting the Keepers of The Cup to bust some 2012-13 NHL Artifacts packs. Then we all headed out to see the Kitchener Rangers play the Erie Otters. The game was sold out and a lot of fun. It was a nice end to a great hockey week! Hopefully this is a trip I can make again next year if I can get time off from putting the gum in packs! 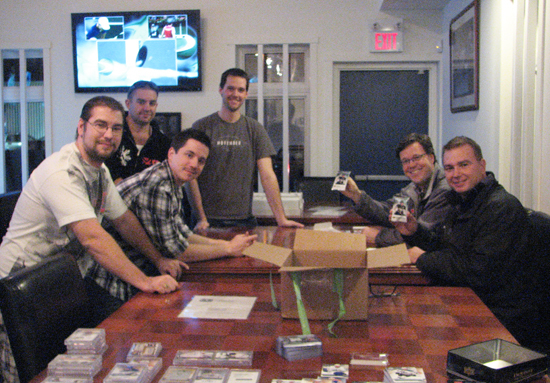 The guys from the Hockey Hall-of-Fame crack some Upper Deck packs! Awesome story and pics! A great 10 days for a huge hockey fan, and for the leader in Hockey trading cards, Upper Deck Co.!